I love ideas, and I love an idea person. It may explain my background in Improvisational Theatre. Give me an idea and I'll run with it, build it, research it, and expand it further. That can be a good thing, and it can also drive people crazy. A few weeks ago, a couple of talented Food Writers ( Elise at CowGirlChef, and Cheryl at Tiger In The Kitchen) came up with an idea for a blogger #Plateswap. I put the "hash" mark on the word because it was an idea hatched on Twitter and that's how they denote a topic. As Food Writers and Photographers of Food, we Bloggers often end up using a lot of our own props, dishes, backgrounds, etc... So, why not have a "Secret Santa" style Plateswap; each person will send another person a new plate, and in return will receive a new plate. Brilliant - and I don't know what was more fun: waiting to hear the response from the gift I sent to Kelsey at The Naptime Chef, or getting a gift in the mail from the adorable Steff at Omaha Chronicles and opening it. Here's the beautiful vintage plate I received from Steff. The idea was simply to prepare a food, photograph it on your new plate and blog about it on the appointed day (today). Here's where my "running with it" starts. I couldn't just prepare something/anything for my gorgeous new present - I wanted the PLATE to tell me what to prepare. OK, guess this is also where my "actress-side" shows up, too. 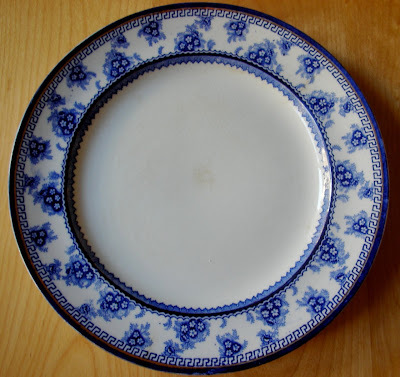 I held the plate, examining it's well worn glaze, it's multi-valued blues, it's pattern that suggested both Asian influence and Puritan background. 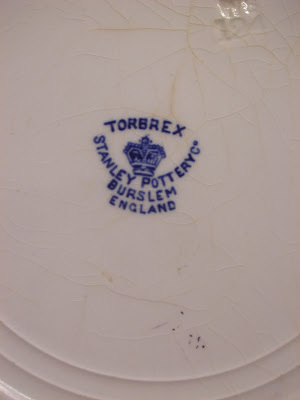 Then I flipped it over; Torbrex, Burslem, England. The Oatcake is like a flat pancake, or a thick French Crepe and has been sold for over 200 years from little windowed shops along the streets. One worker in the area described these as "the national dish for the Potteries". Not very many of the small shops that served these from 6am til afternoon are still open; large Potteries and businesses have taken over the real estate. Like a lot of regional dishes in the world, the recipes and their exact amounts are held very close to the chest and families have guarded and passed their own recipes down through the years; sometimes with heated discussions about whose recipe was better. 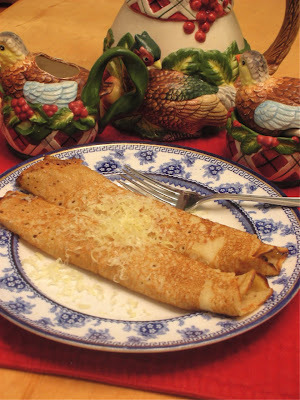 The Staffordshire Oatcakes are served with jam and butter, or eggs and bacon/ham, and cheese, or filled with Nutella or other lunch meats. The filling part seems to be personal. The recipe I used was a combination of several that I experimented with until I could find the right consistency for me (something that reflected the warm, healthy oat meal, but was still light and lacy). This was so fun and I learned about a whole region and its foods that represented more than just "something to eat on the go" to them. That's one of the most amazing things about food - to me. It's why I'm interested in preserving and celebrating the source of foods, the farmers and the dairies, and the time spent together building our own traditions. It was a great honor to learn about the history of this Pottery, the people from that area, and the food that probably was served on this plate before the idea of sending it was even thought up. So, when's my next plate arriving? Huh? Mix in the flours and salt well - cover with a towel and let sit for 1 hour. 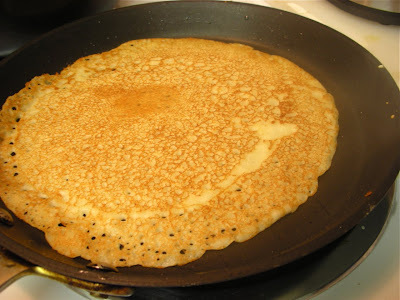 Heat a crepe pan or wide (preferably stick-free) pan on medium heat. Butter or oil the pan slightly. 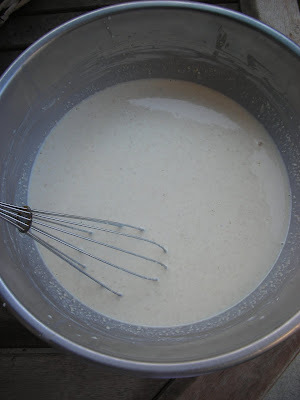 Ladle a small amount of batter onto the pan and swirl the pan to create a plate size, thin pancake/crepe. Cook for a couple minutes and flip with a spatula. Cook for just a moment more and empty onto a warmed platter to hold while making other oatcakes. Serve with your choice (and experiment): jam/butter, cheese, eggs, meats, cinnamon and sugar, nutella, etc..
what a great idea--you really took the idea and ran with it! such a gorgeous plate, too. thanks for sharing! I love that plate! And I love that you let it dictate the recipe - very cool. Those oat cakes sound really good and a fun "make your own" kind of dish, using whatever filling appeals. Oh Cath! you are amazing . . . you synthesize visual and culinary arts . . . plus you are funny and beautiful! complimenti on this beautiful blog entry. I couldn't find any other means to contact you. We met at the Food Styling class. I wanted to thank you again for the ride and a huge thank you for the jam you gave me. It was great to meet you and hope we'll stay in touch. Now I'm going to launch my blog all because of your encouragement! What a gorgeous plate you got ... and the dish was so fitting. So glad you had fun with this!